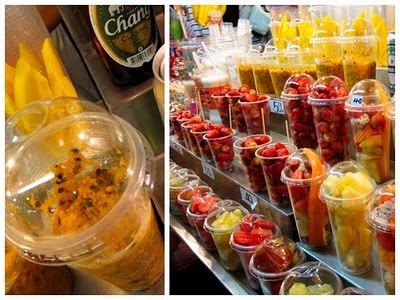 One of the things I look forward to most when visiting a new place is checking out the markets and the street food. You really do get to know more about the culture and the people when you visit its belly. 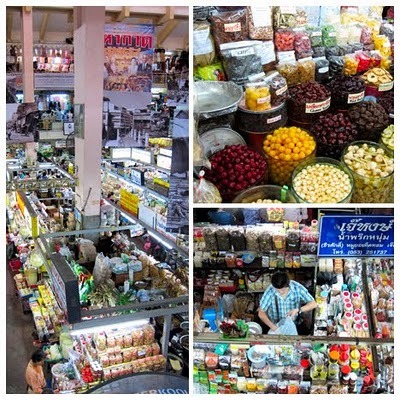 At the food section of the Anusarn night market you get a lot of dried fruit preserves, nuts, durian pastes and local snacks; including that of fried silkworms. 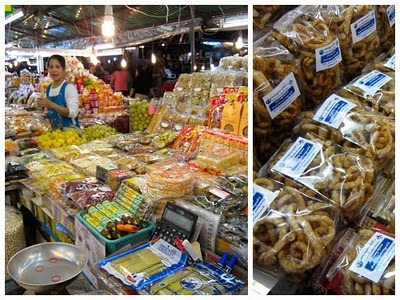 On the right are packs and packs of kep muu (fried pork rinds or chicharon). At a shake shack; still at Anusarn. Fruits prepped and ready to be blended into slushies. I had a big cup of passion fruit shake. So good. Strawberries are also cheap and abundant in Chiang Mai. Street beans. Broad beans or “pop beans” as we call them. A smoldering batch of chestnuts. And some interesting looking peanuts with edgier looking shells. 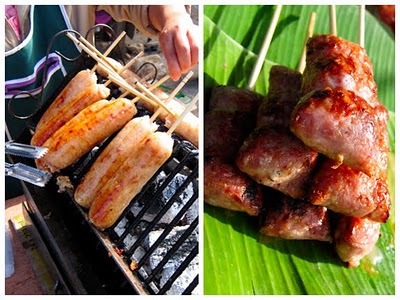 The northern Thais sure like their fermented pork called naem; which is made by letting marinated raw minced pork sit out for a couple of days to get that distinctive flavor (of turned meat) which is then grilled or fried. 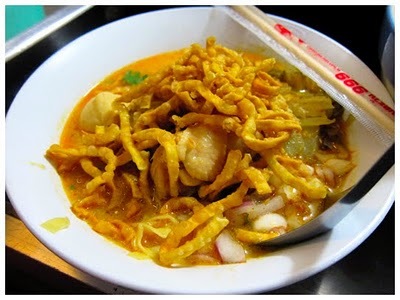 Pictured above are the sausage variants called naem maw. Spicy, a little bit tart, lots of garlic and oftentimes mixed in with some starches. Shredded vermicelli is mixed in with the stuffing on the left. Sticky rice is mixed in with the one on the right. They actually make for some pretty tasty fast food. 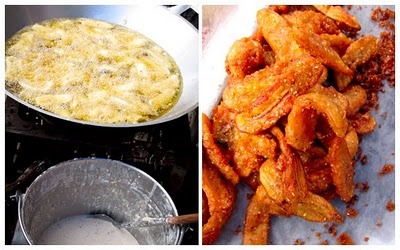 Gluai kaek, or fried bananas are a favorite all over the country. 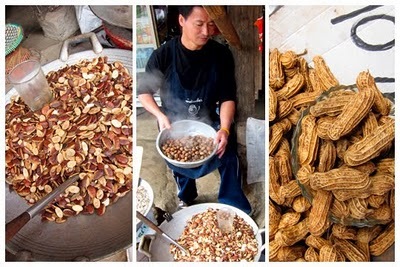 Their version consists of dipping sliced fruit in a light rice flour/coconut water/sesame seed batter to form a sweetish, nutty crust after frying. People snack on this all day and can also be a dessert. If you want to purchase local food (be it raw, cooked, preserved, etc…) they have it all here at Warorot Market. It’s a massive food bazaar with a few other markets surrounding it dealing with more food and produce. There’s also an adjoining food court, but who needs to sit down and eat there when you can sample all the food going around. Textiles and clothes are sold on the upper floors. 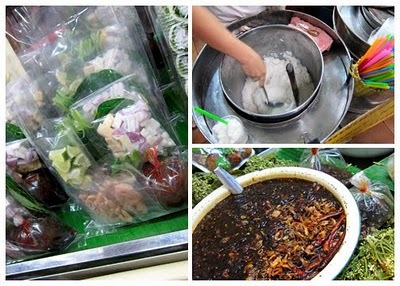 Left: Pre-packaged mieng kam; usually served as a DIY hors d’oeurves at chichi Thai restaurants, I find out they’re eaten as an everyday snack in the north and did in fact originate across the border. To make a serving you place some dried shrimp, manao rinds, slivers of onions, garlic and galangal and toasted coconut on a betel leaf and drizzle with some sweet/savory/spicy shrimp paste based sauce. You then wrap everything up in a small parcel and pop in the mouth. It’s a punctuation of flavors to say the least. Top right; coconut “ice-cream”. More like sherbet though. Not unlike our buko pandan…without the pandan. Nice and icy though a little bit too sweet for my taste. Bottom right: what I assume to be some nam prik pao. The all purpose Thai chili oil. That red film floating on your tom yum? That’s what it is. Deep, smoky and provides a glowing burn rather than a sharp bite. Left: amidst super fresh produce. Right: selling dried beef, candied tamarind and grilled plantains. 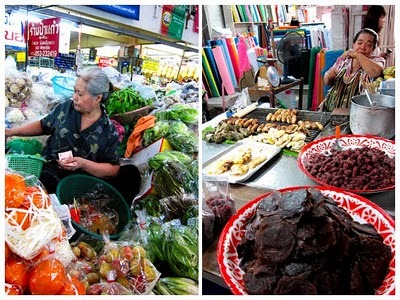 The Anusarn Market opens in the evenings and is more touristy that the Divisoria-like Warorot “day market”. But there are definitely a lot of food finds in both venues and worth a look-see.